I recently started and finished a book called The Book of Awesome by Neil Pasricha. I loved it so much that I bought his second book The Book of Even More Awesome and finished it in a day. I remember when I picked up the first book at Chapters I initially thought I would use some of his quotes in presentations or workshops. It would be motivational and up lifting and people would think it was interesting. You see, Mr. Pasricha has written books on all of the small things in life we often take for granted. He discusses life’s little pleasures that go unnoticed because its human nature to let the negative things hold more weight in our lives than the positive. The bad things that happen to us or to others tend to get more time in the spotlight. As I read the books I wondered how many times in my life I had let the small things slip by without truly appreciating them. We live in a chaotic world and are constantly surrounded and bombarded by negativity, sadness, and heartache. I am not suggesting that we ignore the bad things or pretend they aren’t happening. What I am suggesting is we spend time letting the positive things we experience to have the spotlight too. That we take time each day, in a world riddled with bad things, to see the really good things as well. Reading the books highlighted just how many great things happen daily. The more I read the more I started to really notice these things happening in my life own life regularly. It is a profound thing what positivity can do for your state of mind and mental health. Sometimes adapting an “attitude of gratitude” can influence our days in a positive way which can impact how we feel about ourselves and our relationships. Sneaking cheaper candy into a movie theatre. Stomping on dry crunchy leaves on the sidewalk. Picking the fastest lane at the grocery store. Driving past a cop on the highway, looking down and realizing you weren’t speeding. Phew! Getting to wake up slow on a Saturday morning. When the hiccups finally stop. Getting into bed after the sheets have been washed. Getting the front seat on a long car ride. When somebody holds the elevator door open for you. Water lapping against a dock. Or the sound of waves crashing against the shore. When the delivery food you ordered somehow arrives really early. When you find money in the pocket of your jacket you had forgotten was there. Reuniting a sock from the sock orphanage drawer with its freshly washed, once-lost brother or sister. What are the small things in your life you are grateful for? Share them with us on our Facebook page or Twitter page. 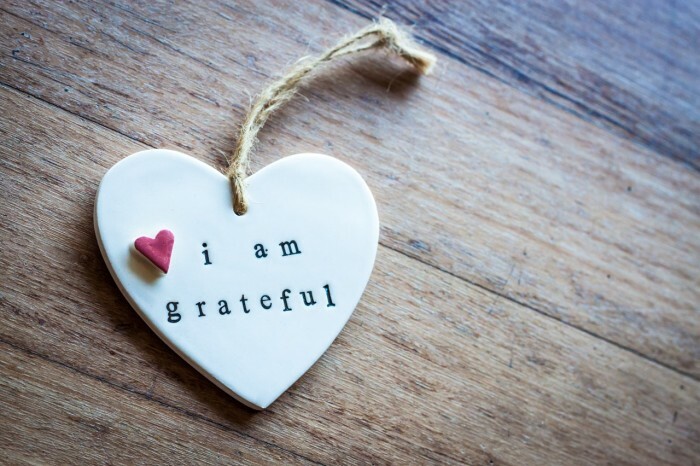 If you are struggling to identify the positive things in your life, check out this blog about building gratitude into your daily life, written by our Clinician Kelly Major. You can also check out one of our 7 walk-in clinics across the county to get additional support.